Build it and they will come! Set the juice. Take absolute control and customize everything from line movement to payouts. Add your magic! Upload your own logo. Direct players to your own domain name. Tailor the look-and-feel of your site. Run reports, track trends, and manage your entire Fantasy operation from the comfort of your own space. BUILD YOUR DREAM FANTASY SPORTSBOOK. Whether you have 10 players or 10,000, Sharpbookie is loaded with features to make managing your entire Fantasy Sportsbook fun, fast and efficient. Made for any web enabled device, share your Fantasy Sportsbook with the world and get action anytime, anywhere. Secure Sockets Layer technology delivers up to 256 bit encryption, the same security used by FDIC insured banks in the U.S. Create custom accounts and give your players access to their own information based on their account type and permission settings. We collaborate with the top industry leaders in data feeds to provide you the fastest and most accurate sports data. 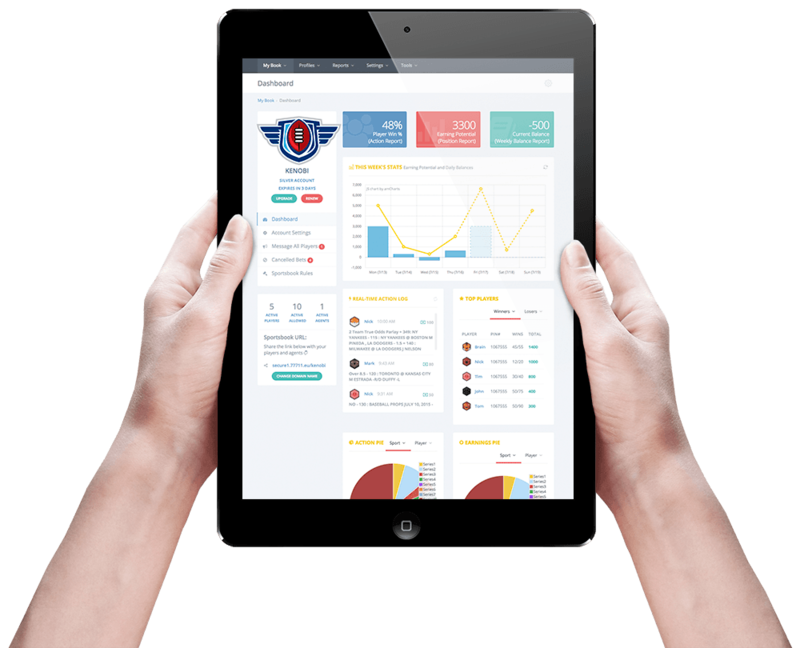 Run reports, analyze data, track trends, and manage your entire Fantasy operation from the comfort of your own space. Team up with Agents and share the action. Set the terms and split the risk to expand your Fantasy Sportsbook empire! Team up with Agents and share the action. Create custom Agent accounts and manage everything from one Master Agent account. Give Agents access to their own information based on their account type and permission settings. Sharpbookie’s powerful pay per head System puts you at the helm. Customize everything from percentage to payout for each Agent account. Take your game to the next level and expand your Fantasy Sportsbook empire! Sharpbookie uses a responsive layout that adjusts to the screen size of your device & supports touch screen devices like tablets and smartphones so everyone can access your Fantasy Sportsbook anywhere, anytime. With familiar customization tools, you can tailor the look-and-feel of your Fantasy Sportsbook site in minutes. Direct players to your own domain name to give your Fantasy Sportsbook a professional edge. Enable White Label to remove all Sharpbookie branding from your site. Add more Player Accounts for $2.50 per head/week. Cover sports odds for 91+ major leagues. Live data feeds ensures that you have the fastest and most accurate sports data. Add 3 Agent accounts to your fantasy sportsbook. Removes all Sharpbookie branding from your site. Get live support from a personal tech conceriege. Start off with 5 player accounts. Cover sports odds for 3 major leagues. Add Agent accounts to your fantasy sportsbook. Add unlimited Agent accounts to your fantasy sportsbook. Sharpbookie© 2017 All Rights Reserved.